Tawaraya, with designers, 1981. Designed by Masanori Umeda. Wooden boxing ring with black and white border. Floor in tatami. The furnishing is made up of coloured silk cushion and wooden tray. Supplied with a numbered metal label. 280 x 280 x 120cm. Photo by Studio Azzurro. 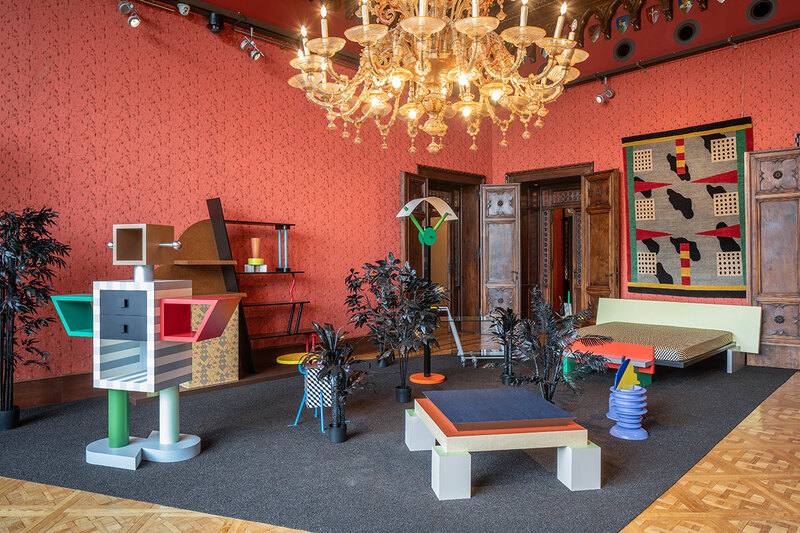 While the neo-Gothic, fairy tale-like Palazzo Franchetti in Venice may seem an odd place to house an exhibition about the Memphis Group, the 80s short-lived design movement whose radical, funny and outrageous sensibility forever changed the industry's landscape, in reality, it couldn’t be a more fitting location. 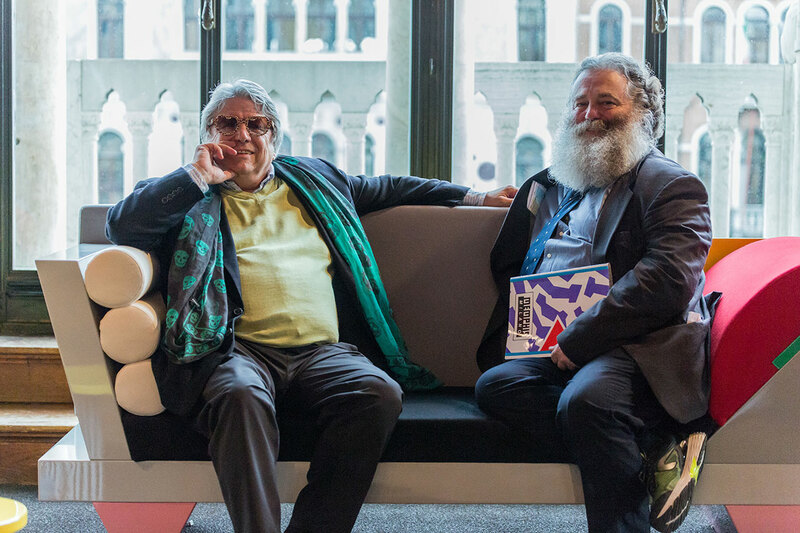 Known for its iconoclastic mischievousness, the group’s late founder Ettore Sottsass would surely be delighted to hear that their rule-breaking, zany designs are antagonizing the pompous interiors of the Venetian palazzo. Hosted by Venice-based Fondazione Berengo during the 16th edition of Biennale Architettura, and curated by Jean Blanchaert and Adriano Berengo, “MEMPHIS - Plastic Field” presents a selection of contemporary productions of the group’s original designs that continue to dazzle after three decades with their irreverent panache. Born as a whimsical rebuke to the minimalist aesthetic and sleek austerity of mid-century modernism, the Memphis Group was formed in Milan in 1981 as a post-modernist design collective, taking its name from a Bob Dylan song that happened to be playing on repeat during the inaugural meeting. Drawing inspiration from both the Art Deco and Pop Art movements, flavoured with a pinch of Dada, the group made a splash with their first collection debuting that same year at Milano’s Salone di Mobile, not just because of its loud primary colours, cheap materials and wacky geometry, but also because it introduced the concept of showcasing prototypes, at the time a novel practice that once embraced by the industry unleashed designers’ creativity and allowed for more experimentation. MEMPHIS - Plastic Field, exhibition view. Tawaraya by Masanori Umeda , 1981. Photo by Francesco Allegretto, courtesy Fondazione Berengo. MEMPHIS - Plastic Field, exhibition view. Carlton by Ettore Sottsass, 1981. 190 x 40 x 196cm. Photo by Francesco Allegretto, courtesy Fondazione Berengo. In the six years until the group was formally dissolved 1987, Memphis produced a range of products, from sofas, tables and sideboards to lamps, glassware and textiles, characterized by an iconoclastic cheekiness that was primarily expressed through synthetic materials like laminate and terrazzo, unconventional geometries that favoured circles and triangles instead of rectangles, and a mishmash of kitsch motifs and gaudy colours. Although the group’s furniture was never a commercial success, their zany design aesthetic informed the late 80s pop culture, from the quirky graphics of the then emerging MTV, to set design in films like “Back to the Future II” and “Ruthless People”, and TV series like “Saved by the Bell”. Sottsass, the group's founder who passed away in 2017, went on to other successful ventures, as did many other Memphis designers, but the brand went out of style, only to regain its popularity during the last decade through the buoyant sales of its original designs and several exhibitions such as Peter Shire’s retrospective at MoCA and Sottsass’ show at Met Breuer, both in 2017, its distinct aesthetic popping up in a variety of mediums from Pierpaolo Piccioli’s 2017 fall collection for Valentino to the American manufacturer West Elm’s furniture collection. MEMPHIS - Plastic Field, exhibition view. Photo by Karolina Sobel, courtesy Fondazione Berengo. MEMPHIS - Plastic Field, exhibition view. Photo by Francesco Allegretto, courtesy Fondazione Berengo. 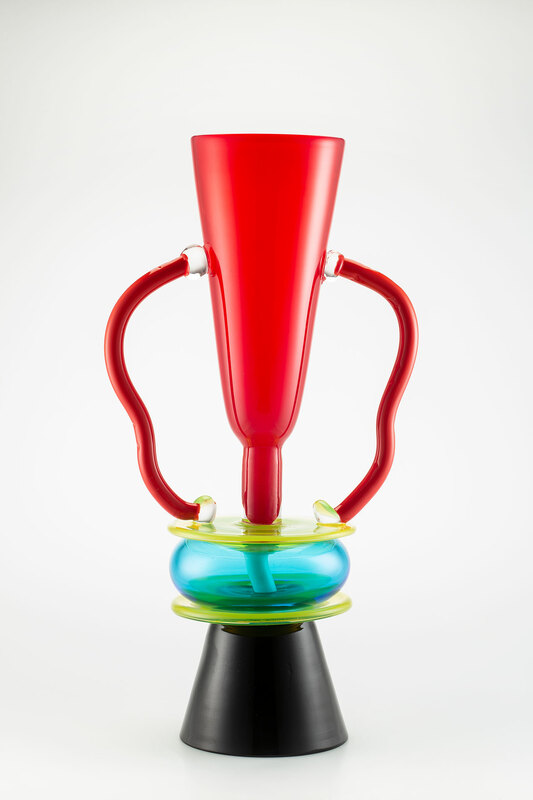 Sirio, design by Ettore Sottsass, Colorful, clear, hand-blown glass, colorless surface layer. Signed on the edge of the stand: "E. Sottsass per Memphis Milano”. Designed in 1982. Signed on the base. Photo by Francesco Allegretto, courtesy Fondazione Berengo. 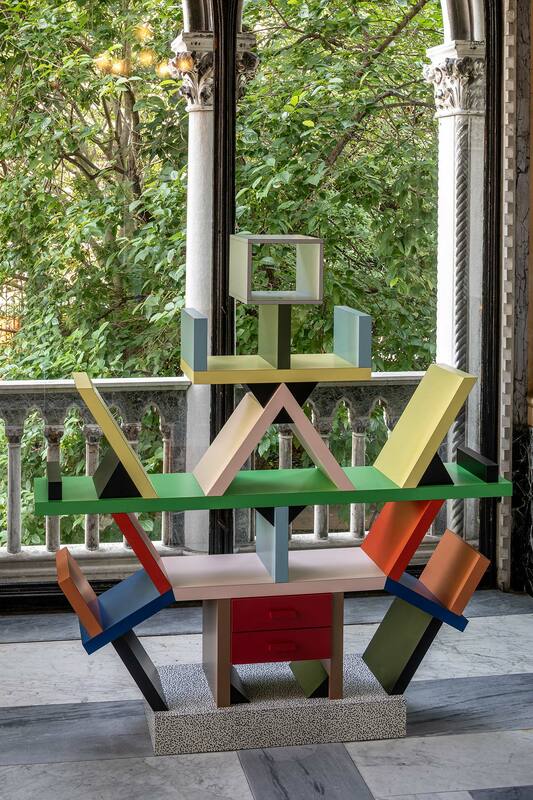 Riding these trends, the exhibition at Palazzo Franchetti evocatively encapsulates the whimsical irreverence that propelled the Memphis Group to stardom featuring several iconic pieces, such as Sottsass' most identifiable furniture design, the "Carlton bookcase"—a skeleton-like structure of different coloured horizontal, perpendicular and angled laminated surfaces—and Martine Bedin’s "Super Lamp", a wheeled contraption that the designer described as “a small dog that I could carry with me". The majority of the works on display sit on black mats, cut in triangular shapes inspired by the group’s geometric language, amidst potted plants painted all-black, part of IB Studio’s exhibition set-up that fades out the palazzo’s gaudy interiors while boosting the exhibits' vivid colour palette. 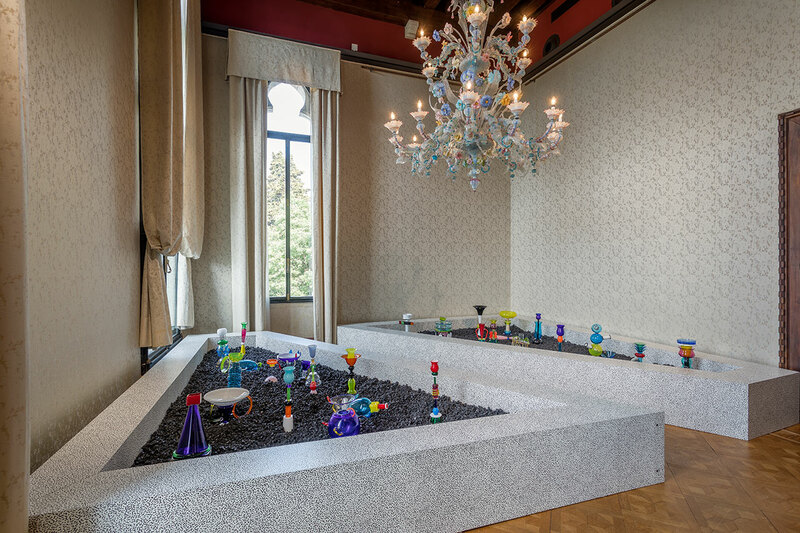 In light of Fondazione Berengo’s commitment to promoting Murano’s glassmaking, accomplished through its Berengo Studio that allows architects, artists and designers to explore the art of glassmaking, Memphis’ quirky glassworks are also given special treatment in the exhibition. 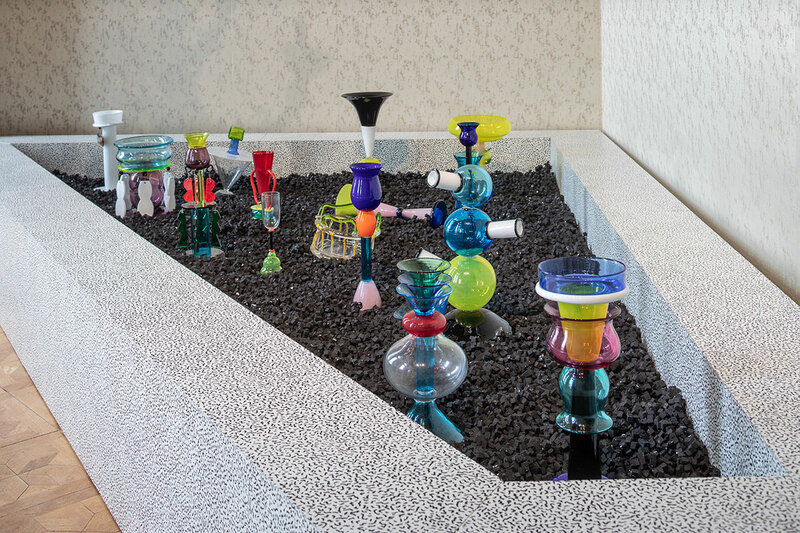 Presented inside two oversized triangular planters filled with black gravel and adorned by the Bacterio print, Memphis’s trademark pattern of squiggles designed by Ettore Sottsass in 1978, the colourful glass objects are almost like bizarre plants blooming in an alien garden. 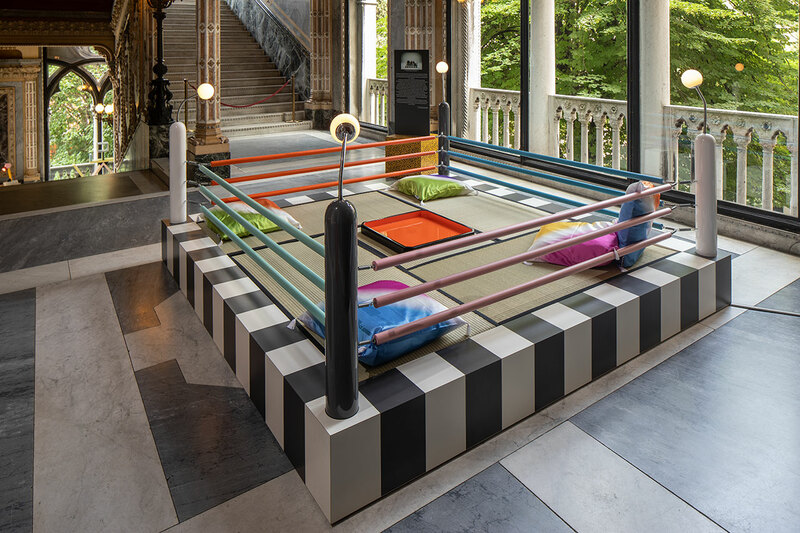 The exhibition would not of course be complete without Masanori Umeda’s “Tawaraya boxing ring bed”, a monochrome striped base featuring multicoloured ropes and integral lamps in its four corners that was featured in an iconic group photo in 1981. The piece (which along with a plethora of other furniture from Memphis’ inaugural collection, was acquired by Karl Lagerfeld for his Monaco apartment which was eventually sold to Sotheby’s in 1991) stands alone in one of the palazzo’s loggias pitching Memphis’ garishness against the setting’s ostentation in a kaleidoscopic boxing match of unleashed creativity. Curators Adriano Berengo and Jean Blanchaert. Photo by Karolina Sobel, courtesy Fondazione Berengo.